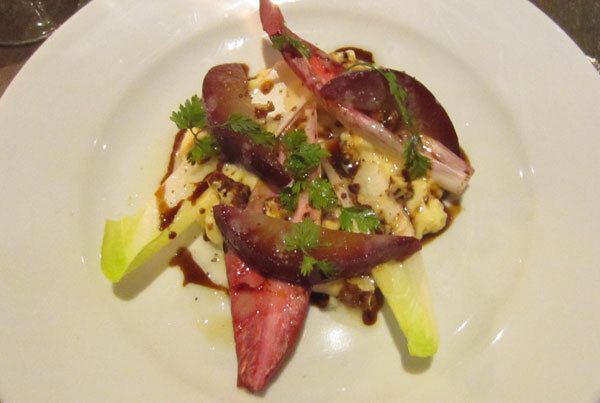 With the London Restaurant Festival kicking off on Monday I was eagerly anticipating my first dinner booking at Bistro du Vin in Soho. I had experienced fellow bloggers salivating over the steak frites and the pure genius of the La Cave à Fromage at this relatively new establishment for the Hotel du Vin group, and I wanted in! Situated on Dean St in Soho which seems to be THE dining hotspot in London at the moment, Bistro du Vin is rather grand with floor space to fit at least five Polpo’s or Ducksoup’s! The interior isn’t that exciting but rather classic with large leather chairs and long banquette seating. We were fortuitously seated directly next to the restaurant’s pièce de résistance, the La Cave à Fromage! I could smell this cavernous slice of heaven as I approached the table and I don’t think I took my eye off it for the duration of the meal! During the London Restaurant Festival (3-17 Oct) Bistro du Vin is offering a set menu – two courses for £18.50, three courses £24.50. With four choices for each course we were quite impressed. Although having also being presented with the a la carte menu we did get a little distracted! 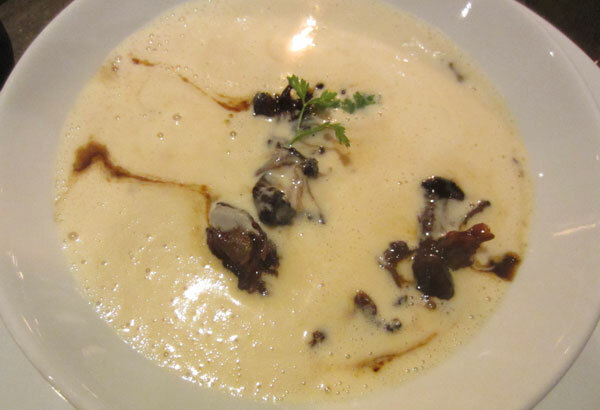 I started with the Haricot blanc veloute and braised ox tail. A foaming soup of haricot beans and cream was poured over tender pieces of braised ox tail, it was delicious and the ox tail perfectly cooked but so rich that I couldn’t finish it. Creamed brie was perfectly paired with red wine poached pear and caramelised pecans. I had serious food envy over this one. 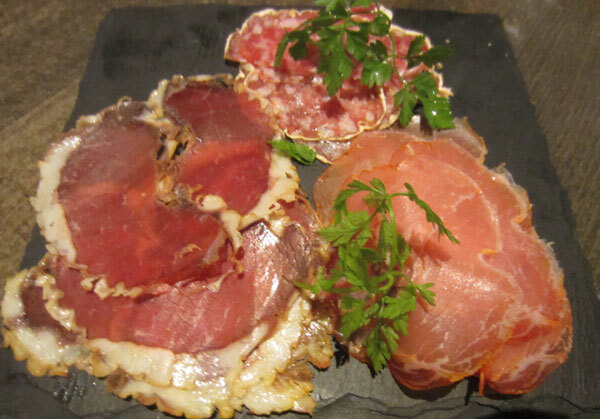 The charcuterie board with three different cured meats, paprika spiced to sublime. The meats are sliced just outside the cheese room and conveniently right next to where we were seated. We were spoilt by the host Ben, who kept passing over a small slate tile with slithers of melt in your mouth meat as he sliced it for other diners! We weren’t complaining, and I already thought being sat next to the cheese room was the ultimate position! Two of my fellow diners ordered their starter off the a la carte menu, squid with asian greens and soy which sounded great but was a little disappointing. The squid was overcooked and the soy was a little overpowering. 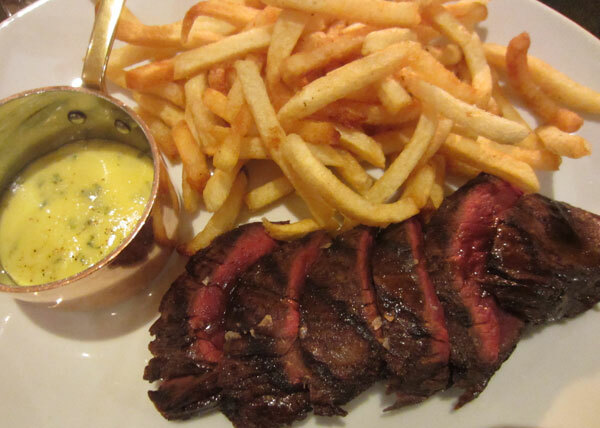 Couldn’t go past the onglet steak frites for my main. The steak was perfectly cooked medium rare and lightly salted. 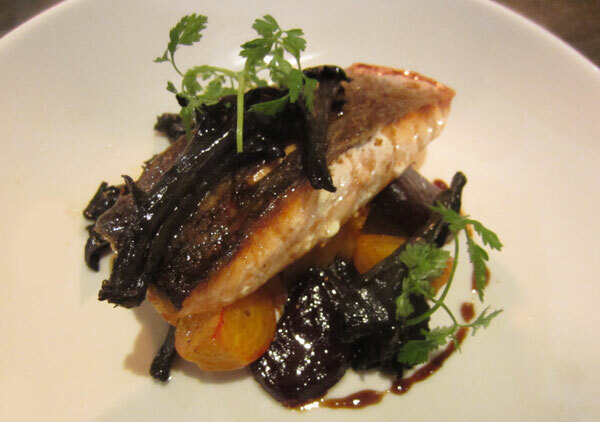 Roast salmon, beetroot and trompette was another great choice from the set menu. Crispy skinned, the salmon was perfectly pink on the inside and the addition of wood ear mushrooms gave the dish a nice texture. The meal was let down by the lacklustre desserts. 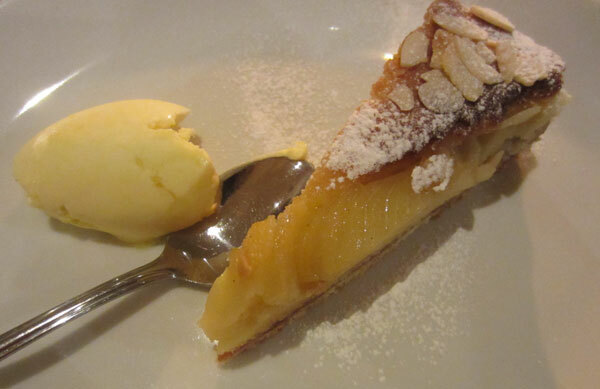 Pear and frangipani tart was a little pastry heavy and a thin spread of frangipani jam was lost somewhere in between. 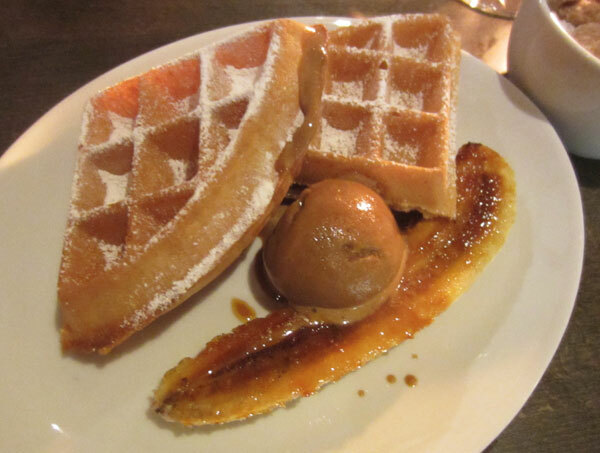 Belgium waffles were not fresh but rather chewy and dry and the chocolate sauce was nowhere to be found yet the caramelised banana was a surprise addition! Perhaps should have gone for the Artisan cheese plate! We had been eyeing off diners being taken into the cheese room and sampling the fine fromages and decided our night would not be complete without entrance into the promise land. So smiling sweetly at Ben he turned the key and we were like kids in a candy shop! The restaurant offers a cheese and charcuterie platter – with unlimited (yes that’s correct, unlimited) cheese for £12.50! When I quizzed Ben about this ‘unlimited’ offer his response was that people do have a limited to the amount of cheese they can consume. I will be returning to Bistro du Vin for an evening of wine and cheese and we’ll just see if Ben still uses that response! 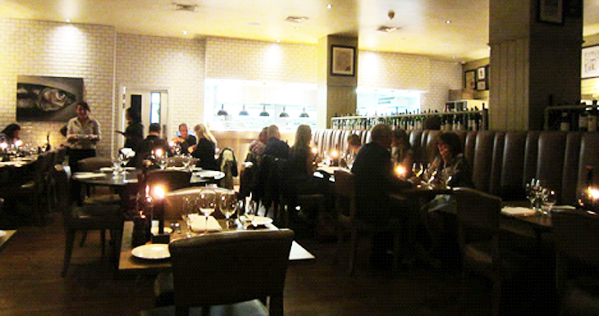 Bistro du Vin offers robust French bistro food in a very pleasant setting and with exceptional service. The La Cave à Fromage gives the restaurant that edge it needs to play with the cool kids of Dean St traders. Lady R, the steak onglet really was awesome and I agree the desserts made for a lacklustre finish to what was an enjoyable experience especially when I put what I thought was a big spoon of vanilla ice cream in my mouth (as stated on the menu) to find it was in fact clotted cream! Top marks definitely go to Ben the GM who clearly understood the meaning of looking after your clientelle. He cottoned on very quickly that to please Lady Rhubarb, one must feed her large amounts of charcuterie and cheese and then some more cheese! 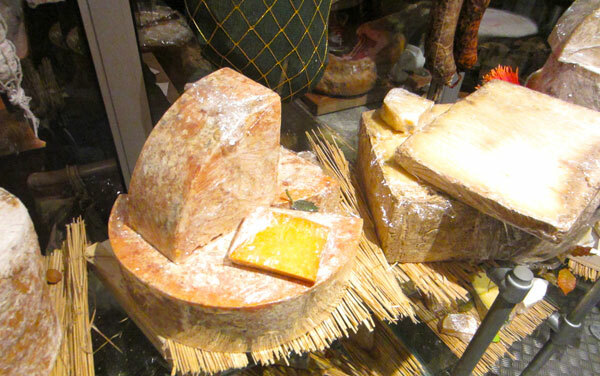 I love the concept of ‘La Cave de Fromage’! I cannot wait to go and experience it all for myself, the dishes look delicious!